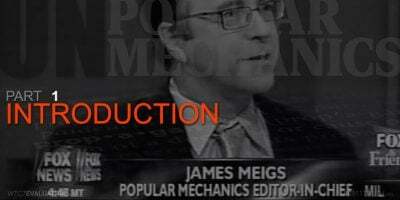 Part 1: Introduction, Popular Mechanics (PM) has been the primary cheerleader in the mainstream media defending the NIST reports. A decade has passed since the tragic events of September 11, 2001, and many people feel that we have still not had a real investigation into what really happened that day. Indeed, a growing number of citizens believe that the probe into the destruction of the three World Trade Center skyscrapers by the National Institute for Standards and Technology (NIST) was at best incomplete and at worst fraudulent. These critics include the 1,600-plus architects and engineers who have signed the AE911Truth petition demanding an unbiased, independent investigation into the attacks. By contrast, Popular Mechanics (PM) has been the primary cheerleader in the mainstream media defending the NIST reports ever since its book, Debunking 9/11 Myths: Why Conspiracy Theories Can’t Stand Up To the Facts, was published in 2006. For the ten-year anniversary of 9/11, PM put out a second version of its book, which it updated in an attempt to dismiss new findings that corroborate the controlled demolition hypothesis. The main revisions concern the collapse of the Twin Towers and World Trade Center 7. The revised version of Popular Mechanics’ book Debunking 9/11 Myths, far right, continues to defend myths that are scientifically impossible. Our 10-part series, which starts with Part 1 today, demonstrates that PM has still not adequately explained the numerous anomalies surrounding the collapse of the Twin Towers (WTC 1 and 2) and WTC 7—anomalies that prove the structures were destroyed with explosives. The introduction to PM’s chapter on the collapse of the Twin Towers briefly discusses the main theory put forward by members of the 9/11 Truth Movement: “The buildings were brought down intentionally—not by hijacked airplanes, but by government-planted bombs or a controlled demolition” (pg. 28). PM then goes on to give a few examples of people promoting this theory. One of the people they cite is a Danish writer named Henrik Melvang, who, according to PM, “markets his book and video claiming the Apollo moon landings were a hoax” (pg. 28). This is obviously an attempt on PM’s part to portray those who question the collapse of the Towers as conspiracy theorists who have irrational beliefs. PM also cites Morgan Reynolds, the chief economist at the U.S. Department of Labor during President George Bush’s first term, as someone who believes that the three WTC towers were destroyed through controlled demolition. Though Reynolds and a handful of other skeptics cite academic credentials to lend credence to their views, not one of the leading conspiracy theorists has a background in engineering, construction, or related fields (pg. 28-29). This statement is by far one of the most off-the-mark passages in PM’s book. One need only look at what most consider the lead organization in the 9/11 Truth community, Architects & Engineers for 9/11 Truth, to see that there are currently over 1,600 professional architects and engineers with backgrounds in engineering, architecture, and building construction who question the destruction of the three WTC high-rises. How can PM possibly have omitted mention of more than a thousand experts who all contend that the Twin Towers and WTC 7 were brought down with explosives? In PM’s entire 216-page book, there is not a single mention made of AE911Truth or its founder, architect Richard Gage. When one looks back at their 2006 book, we can see that this exact same statement appears on the exact same pages. This fact shows how PM has decided to structure their new book: i.e., update it only where it benefits them. As we will see, this tactic is used more than once in PM’s grossly flawed book. PM discusses the incident in 1945 when a B-25 bomber lost in the fog crashed into the side of the Empire State Building. They claim that “some conspiracy theorists point to [this incident] as proof that commercial planes hitting the World Trade Center could not bring down the towers” (pg. 29). To counter this assertion, PM compares the construction of the Towers to the construction of the Empire State Building, calling the former structures “in some ways more fragile” (pg. 30). They also quote structural engineer Jon Magnusson, who says, “These structures look massive, but they’re mostly air. They are air, punctuated with thin layers of concrete and steel” (pg. 30). 4. BECAUSE OF ITS CONFIGURATION, WHICH IS ESSENTIALLY THAT OF A STEEL BEAM 209′ DEEP, THE TOWERS ARE ACTUALLY FAR LESS DARING STRUCTURALLY THAN A CONVENTIONAL BUILDING SUCH AS THE EMPIRE STATE BUILDINGWHERE THE SPINE OR BRACED AREA OF THE BUILDING IS FAR SMALLER IN RELATION TO ITS HEIGHT. It is quite apparent that the Towers were extremely well built—and may have been even more structurally sound than the Empire State Building. Even supporters of the official conspiracy theory, such as Thomas Eager, praise the buildings’ structural integrity: “The towers withstood the initial impact of the aircraft. . . . [T]he buildings had more than 1,000 times the mass of the aircraft. . . . [T]his ability to withstand the initial impact is hardly surprising” [Eagar and Musso, JOM, 53 (12) (2001), pp. 8-11]. Next PM quotes WTC assistant structural engineer Leslie Robertson’s comment that the Towers were only designed to take the impact of a Boeing 707, but did not take into consideration the fires that would be produced by the jet fuel. After 9/11, Robertson noted, “I don’t know if we considered the fire damage that [a plane strike] would cause” (pg. 31). Although PM mentions John Skilling briefly in their book, they make no mention of this statement from him. Apparently, PM felt no need to quote the lead WTC engineer on his views about the structural strength and stability of the Towers. The next section of PM’s book deals mainly with the damage to the lobby floors of the Towers and mentions the assertion by the 9/11 Truth Movement that lobby destruction proves explosives were planted in the buildings. The argument that the PM book puts forward is different: It claims that the jet fuel from the planes traveled down through the elevator shafts and caused explosions that damaged the lobby. 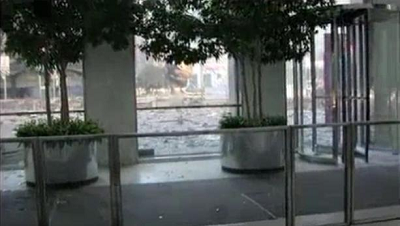 The walls and trees in the lobby of one of the Twin Towers show no evidence of being burned by a jet fuel fireball, which Popular Mechanics claims was the cause of an earlier explosion. Although viewpoints differ within the 9/11 Truth Movement4 regarding the cause of these explosions, some features of the lobby damage indicate that they were not due to a fireball explosion from the jet fuel. For example, the white marble walls show no signs of being exposed to fire. Also, the plants next to the blown-out windows show no signs of having been burned.